Back Under The Sea, plus Filmation's DC Super Heroes! I’m a little tardy on the updates this week, partly because we’re still catching up with recent reviews. 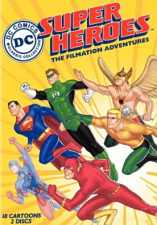 Speaking of which, here’s my take on the recent release of DC Super Heroes: The Filmation Adventures, a two-disc collection of the individual “guest character” segments from 1967’s The Superman/Aquaman Adventure Hour. The appearance of Aquaman on the cover is a little cheat: apart from popping up in the into to the Justice League cartoons in the set, he’s actually absent from any of the stories, so if you’re a classic Aquafan you’ll need to track down his own DVD collection. This is a great time to be a Filmation fan, what with BCI’s sterling work in bringing their often mocked but much loved television properties to disc, and Warners seem to have been spurred on by their success to start releasing their own DC-owned characters to the format. The real surprise here, and for many the real reason the set is worth owning, is the Animation Maverick: The Lou Scheimer Story documentary: 40 minutes of classy quality interviews and rare footage that really does justice to the co-founder of this little studio that could. Now if only Tarzan could swing onto DVD…! Elsewhere on the site today, Jeremie continues his dive beneath the waves to meet art director Tony Pulham, a veteran of Warner Bros. Feature Animation (Quest For Camelot, The Iron Giant) and DisneyToon’s own Pooh’s Heffalump Movie who brought his considerable experience to recreating The Little Mermaid‘s world for her latest adventure, Ariel’s Beginning, which we reviewed last week. It’s a highly interesting piece and, as usual, Jeremie has been able to pack it with unique pop-ups that allow for a look at Tony’s layout and background artwork in detail! Finally, just before I sign off, I’ll just let it slip that it’s my birthday today – not for any well wishers to send me their regards, but because it’s the trigger for me to run out at the weekend and pick up a Blu-ray Disc player! I’m finally going Blu, joining James and Rand in the hi-def camp, so be on the lookout for more and more BD reviews! Don’t worry – we’re not going to leave those watching regular DVD in the lurch, but I know Rand has a few upcoming titles in the works for you and hopefully I’ll be able to post some too in future. Things in our world haven’t always looked so rosy, and I’d like to just take a little time to end on a rare sombre note and remember those who lost their lives seven years ago today. I was in New York City the week before the attacks on the World Trade Center and, back home, found myself editing horrific news footage soon after it all happened. Despite the celebratory nature of a birthday, every year brings back those memories. I’ll never forget the atmosphere of the WTC those few days before, and we all should never forget the ordinary folk and everyday heroes who perished in the horrendous events of September 11 2001. God bless them all.